Brenda lives in northern Virginia with her husband, daughter, and other various creatures who share their backyard wildlife habitat. Brenda became a Master Gardener in 2007, after attempting to put down roots in a yard filled with clay, stones, and poorly laid sod. Little by little, she and her family removed grass, amended soil, and replaced invasive weeds with native plants. The family now grows vegetables in raised beds year-round. Brenda, who subsequently became a Master Food Volunteer, cooks mainly with seasonal ingredients from her garden, or from local farmers markets. She invites you to join her on her mission to build an eco-friendly habitat, grow organic food, and sustain the small plot of earth we each claim. Brenda shares her gardening, cooking, and beekeeping experiences at beehappygarden.com. Nothing says spring quite like asparagus. Growing your own spears takes a little upfront effort, but the rewards are manifold. Asparagus is considered a "valuable" crop, meaning it's pretty expensive to buy it at the market. It's a hardy perennial, so once established, it returns each year. Soil preparation is key, so as soon as soil can be worked in later winter or early spring, begin amendments. First, chose a sight that receives full sun and good drainage. Asparagus likes a soil pH between 5.8 and 6.5. If you're not sure of your soil's pH, the Virginia Cooperation Extension will test it for you and send back the results, including recommendations for amendment. You'll probably need to enrich the soil with composted manure, bone meal, humus, or composted leaves (leaf mold). It is useful to amend the soil at least 6 months before planting, in order to give the planting area time to mature. that receives at least part-sun. 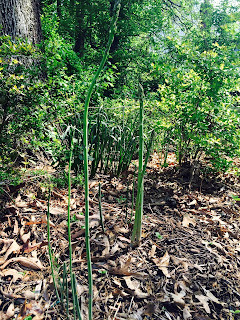 Asparagus fits nicely into a woodland area that receives at least part-sun. Double-dig the planting area by removing the first foot of soil, and then breaking up the next 12 inches of subsoil. Dig trenches twelve to eighteen inches wide, and four to five feet apart. Mix the topsoil with organic amdendments, and refill the bed. 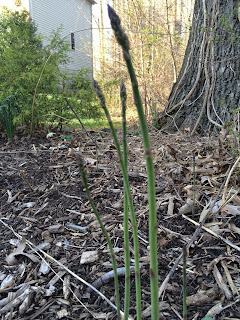 Plant asparagus crowns, purchased from a reputable nursery, around the same time that you would plant peas and potatoes; in other words, when soil can be worked in spring, before days grow long and warm. Recommended cultivars for Virginia are Jersey Knight, Jersey Giant, Jersey Gem, and Purple Passion. Keep the bed weed free and evenly moist. A two-inch layer of mulch will help with temperature and moisture control. Apply a balanced fertilizer in late winter, before spears emerge. 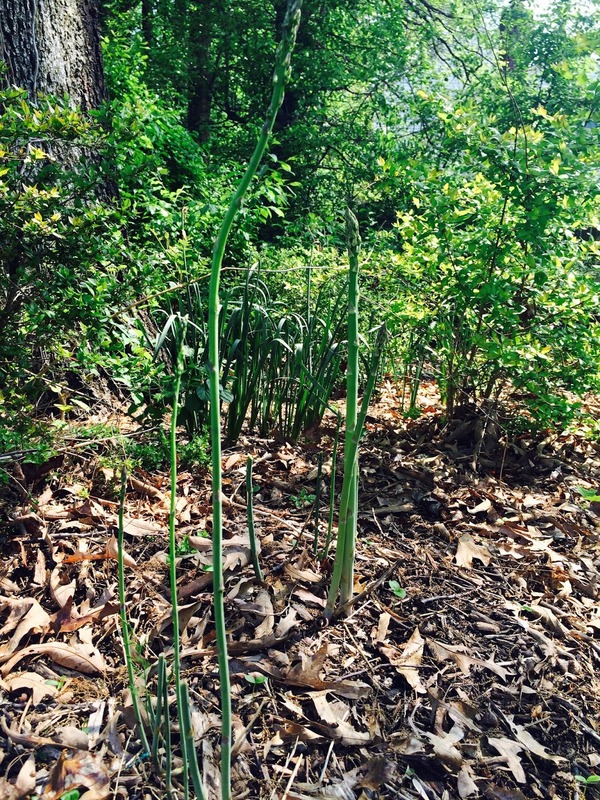 Unfortunately, harvesting asparagus in the first year is not recommended. The plants need energy to fully mature. In the second year, take just a few spears. The third year will be the most productive. 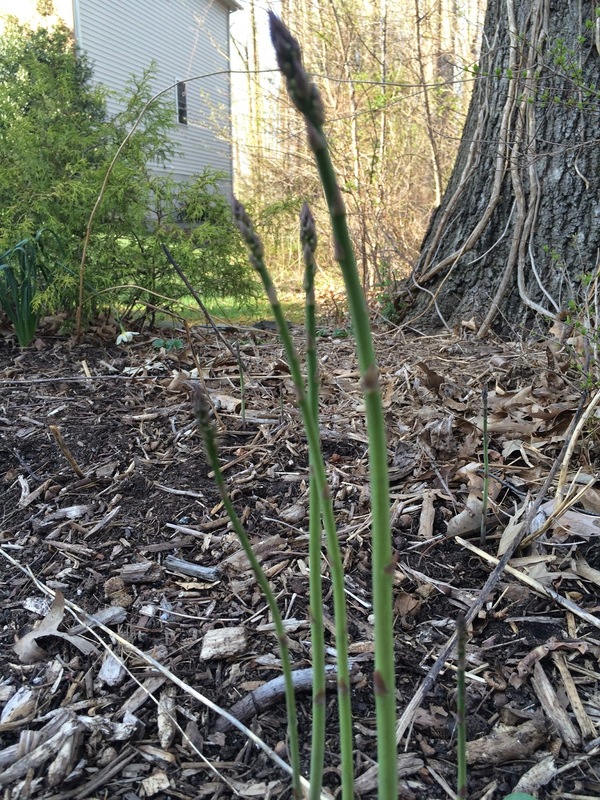 Snip spears when they're no bigger than a pinkie finger, before the tips begin to flower.